The more you use your PC, the more it gets bogged down with old, outdated, and incorrect, Registry errors. These problems slow down your PC and potentially lead to crashes and other problems. RegistryBooster 2010 finds those Registry troublemakers and fixes them for you, and helping your computer run in tip-top shape. RegistryBooster 2010 does a thorough job of cleaning your Registry. RegistryBooster 2010 is exceptionally easy to use. Tell it to do a scan, and it delves into your Registry, uncovering problems as it goes. It then shows you the results of what it finds. Unlike many competing products, it also shows you the severity of each on a graph, ranging from low to high. Tell the program to clean up your errors, and it first backs up your Registry so you can restore it in case of problems, then fixes them for you. Note, though, that the unregistered version will only clean 15 errors. You'll have to pay to fix more than them. RegistryBooster has some nice extras, such as a Registry defragmenter, and the ability to ignore certain areas of the Registry from scanning. Given that there are free Registry cleaners out there--such as the one built into free program CCleaner--the question is whether it's worth paying $30 for RegistryBooster 2010. 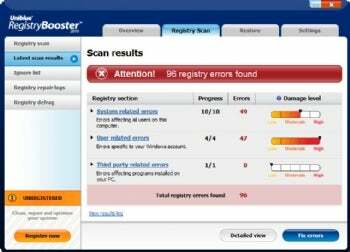 RegistryBooster clearly dug deeper and found more problems with my Registry than did CCleaner, finding 96 Registry errors compared to ten for CCleaner. And it provides far more information about each Registry issue it uncovers as well. So if you're looking for absolute top-of-the-line cleaning, RegistryBooster is worth it. If not, a freebie like CCleaner will do fine.